The below map shows the location of the properties Greenwood has acquired so far, along with a brief description. The lands under threat are NOT within a designated aggregate resource area, are surrounded by rural residences and farms and consist of prime farmland. They are directly adjacent to UNESCO World Biosphere Reserve Niagara Escarpment and Nottawasaga Valley Conservation Authority plan areas and contain vulnerable water sources. According to NVCA interactive maps, highly vulnerable aquifers are located on the property and nearly the entire area is marked as being a "Significant Groundwater Recharge Area". The properties are bordered by roads that many families use, to get to and from school each day and due to the significant grades on these roads, loaded trucks will have difficulty reaching/maintaining normal speeds, thus presenting a danger to other traffic. 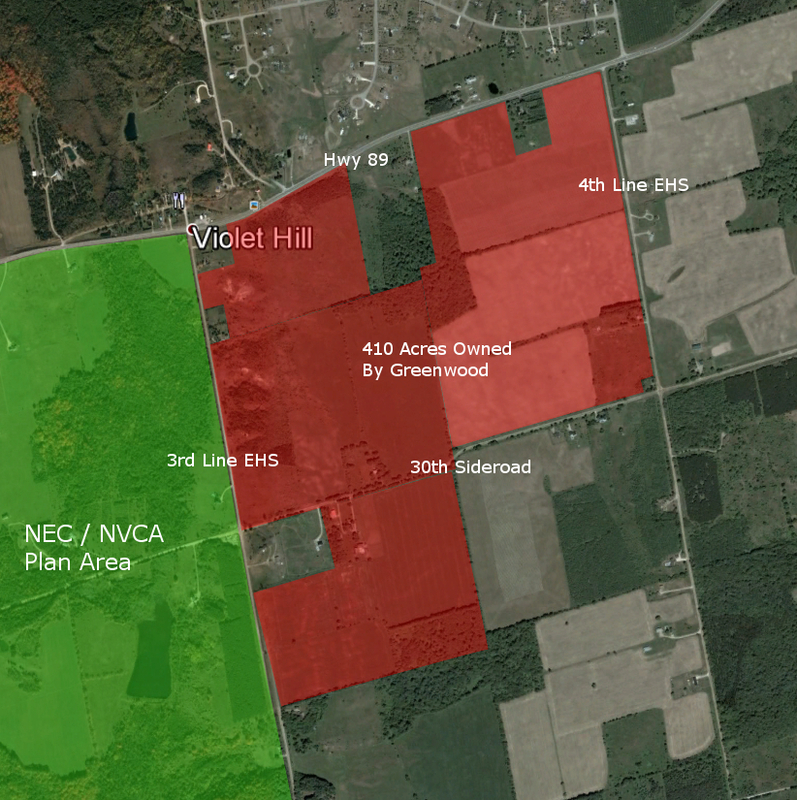 Over 70 homes including the hamlet of Violet Hill with its adjacent subdivision between 3rd and 4th lines (at top of map), all of which rely on individual wells, will be directly impacted by the many issues such pits impose on their neighbours and the wider community.